Jasmine Frank is certainly the most accurate shooter at present in local Netball competitions. First, she copped the award in the Ashburton Sports and Cultural Organisation (ASCO) competition. Then, Frank followed up in the Marriaqua Co-operative Credit Union Marriaqua Sports Association (MSA) Competition. Her latest accolade was acquired last week Thursday at the Closing Ceremony of the Minors Construction Calliaqua Area Development Organisation (CADO) Tournament. Frank, who represented ASCO in all three competitions, had a 76 per cent shooting accuracy, scoring 206 goals. Voted her teamâs Most Valuable Player, Frankâs efforts were not good enough as ASCO was second best to High Park and TRAC One in the Marriaqua and Calliaqua competitions, respectively. This, after ASCO blew away all competitors in their home tournament. ASCO also placed second in the Knock Out of the CADO version, losing to TRAC One 40-60, in last week Thursdayâs final. Along with Frank, those awarded at the Calliaqua ceremony were Kailene Thompson, voted the Best Defender and Annella Samuel adjudged the Best Mid Court player. Both Thompson and Samuel represented the double crowned champion. CC Crystals took away the League and Knock Out titles, as well as the three outstanding awards in Division Two. 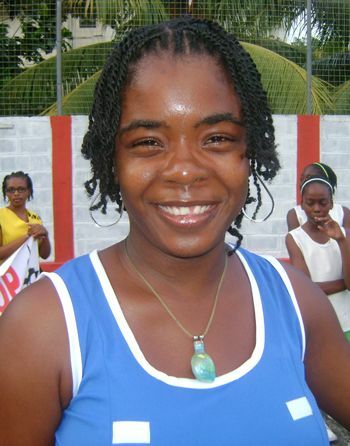 Snapping up the Best Shooter trophy was former national Under-23 player, Debbie Lavia. She scored a total of 124 goals, which represented a shooting accuracy of 72 percent. National female footballers, Akeir Samuel and Samantha Carrington secured the other awards. Samuel was the Best Defender and Carrington, the Best Mid Court Player. And, with the national club tournament into its first week of action, Frank, who has switched allegiance from Western Union Mitres will be honing her skills with X-Ceed Sports Club in the Division One.